For three days a week, ten months of the year, Sri Lanka’s fishermen in the North are forced off the seas by a swathe of hefty Indian trawlers for which their fibreglass boats are no match. Residents of Pesalai and Talaimannar in the north-west coast can often see the trawlers bobbing on the horizon during evening hours. They cross into Sri Lankan waters by nightfall, haul their nets over the seabed and leave unhindered before dawn, with catches of fish, succulent prawn and pricey sea cucumber. Indian trawling in Sri Lankan seas is a longstanding issue. But researchers warn it has reached such overwhelming proportions that a serious conflict is looming. The Indian fleet has burgeoned to nearly 2000 vessels. Discussions between the two governments have not helped. “The Indian trawlers are only absent in June and October,” said Herman Kumara, convenor of the National Fisheries Solidarity Movement (NAFSO). “They come in huge numbers from Rameshwaram towards Talaimannar. They also approach Jaffna from the Nagapattinam side. They were recently seen on the Mullaitivu and Pulmoddai sides while fishermen in Kokilai and Nayaru are also reporting poaching,” he said. Mr. Kumara claimed that two weeks ago, the trawlers were observed as near as seven to eight kilometres from Uchchimunai Island in Kalpitiya. Sri Lankan fishermen keep away on such days because their boats, engines and nets are damaged by the large Indian vessels. By dragging iron bars along the seabed, poachers destroy everything, including coral reefs and seaweed. Maarten Bavinck, a Dutch researcher and expert on marine fisheries in South Asia, recently spent several weeks in a coastal village in Sri Lanka’s north-east. He asked fishermen to keep a record of their fishing operations. “On average, they haven’t been going out more than sixty days a year,” he recounted, in an interview with the Sunday Times. Fishermen are forced to find other work, to supplement their meagre earnings. “It is having a major impact on the livelihoods of these people,” he stressed. “They are very angry and very frustrated,” he said. Dr. Bavinck said an estimated 25,000 fulltime fishermen in the Northern Province have been affected. When their families are counted, this figure rises to more than 100,000. It is a severe blow to a community that suffered intensely during thirty years of war. Last year, fishermen captured several Indian trawlers off Point Pedro. These were quickly released by Sri Lankan authorities and the fishermen were warned not to repeat such a feat. “But they have little option in terms of how to voice their grievance and to get it on the agenda,” Dr. Bavinck said. Dr. Bavinck is director of the Amsterdam based Centre for Maritime Research. Interestingly, he grew up in Jaffna where his father, the missionary Ben Bavinck, was a teacher at Jaffna College. He first studied the north-east coast in the late 1970s, for his Master’s degree. Dr. Bavinck now heads a project in which several academic and non-academic institutions across three countries—South Africa, India and Sri Lanka—are studying fishing conflicts. They aim to understand the situation and to help improve governance in areas like the Palk Bay. The Universities of Ruhuna and Jaffna are among their partners. Damage to the ecosystem is an urgent concern. A recent study in Spain has shown that trawling has significantly levelled the seabed, changing the marine environment with detrimental consequences for fish stocks. “A decrease in the size of the trawling fleet is a must if this is to be successful in any way,” he reiterated. “Only then can Indian fishermen stick to their own waters. Now they are relying on fish stocks that are not in their own waters.”But just as much as poaching impacts employment on the Sri Lankan side, a cutback in the trawling fleet will now aggrieve large numbers on the Indian side. “If you’re talking of 25,000 seagoing fishermen in Sri Lanka, the number of fishermen on the Indian side who depend, to varying degrees, on Sri Lankan resources would be 30 to 40,000, even 50,000,” said V. Vivekanandan, Secretary of the Fisheries Management Resource Centre (Fishmarc) in Trivandrum. He is also an advisor to the South Indian Federation of Fishermen Societies. 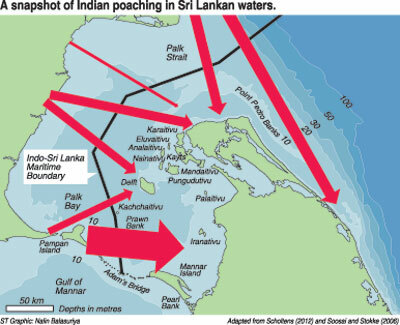 Beleaguered fishermen in Sri Lanka’s North ask why the Navy does not stop Indian poachers. The answer lies in an India-Sri Lankan Joint Statement on Fishing Arrangements issued after talks in October 2008 between Economic Development Minister Basil Rajapaksa and Indian officials. An India-Sri Lanka Joint Statement issued on January 22, 2013, repeats these pledges. It says both sides were committed to decreasing incidents pertaining to fishing on the International Maritime Boundary Line (IMBL). They concurred that the use of force could not be justified under any circumstances and agreed to treat all fishermen humanely. They welcomed decisions of a Joint Working Group on Fishing and encouraged senior officials to meet regularly. But nothing the two governments have agreed on has solved the problem. The Joint Working Group on Fishing, set up amidst much applause, has met just twice and also produced nothing worthwhile. Authoritative sources told the Sunday Times, “There’s no agreement in the offing”. “Sri Lanka is only discussing with Indian authorities to discourage people from crossing the IMBL,” they said. They also said that Sri Lankan fishermen continue to be arrested when they trespass into Indian waters. While they are released speedily in Tamil Nadu, it could take as long as three to six months to secure their release in Orissa, Andhra Pradesh, Lakshadweep and the Andaman and Nicobar Islands. V. Vivekanandan, an Indian activist, said it was significant that both countries have recognised the fishing conflict could not be resolved by force. But he was disappointed that official, bilateral talks have not borne fruit. He said government support for informal discussions between the fishermen in India and Sri Lanka would be infinitely more useful. In 2004, a meeting was held in Colombo between 21 fishermen from South India and 30 fishermen from Sri Lanka’s North. The idea was for the two communities to reach agreement. The Sri Lankan fishermen made it clear that they would never accept trawling. The idea of a trawl fleet reduction was floated. The second meeting took place in August 2010 (the war and tsunami delayed the process). Observers from Sri Lanka’s Fisheries Department also attended.